This photograph of Ward 2 was taken in the early 1900s. The ward is an open plan 'Nightingale Ward' named after Florence Nightingale. In the centre of the ward is a large coal-fired heater, the floors are wooden and there are no curtains. 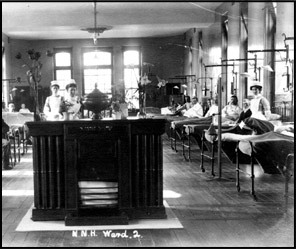 There are many differences between wards of the 1900s (life on the wards, the role of nurses and the environment) and today.